Pilana Metal, a Czech manufacturer of bandsaw blades, has introduced wet blasting into its manufacturing operations – and as a result has seen a fivefold boost in line speed. In January 2017, the company took delivery of a Profelis wet blasting system with hot wash unit from UK-based Vapormatt – which also provided experts to train staff at its headquarters in Hulín. Pilana had earlier rented a similar machine from Vapormatt, and trialled it over the preceding six months. The Profelis is a continuous automatic machine that runs for three shifts a day. Pilana uses the new machine to provide a cosmetic finish and cutting edge enhancement to the teeth of its 13-80mm bandsaw blades. For Jiří Michal, the owner of Pilana, wet blasting has improved product quality while boosting throughput from 1.5m/min to 8m/min. “Our old dry blasting machine was a bottleneck in the production process,” he says. The main disadvantage of dry blasting was that it generated huge quantities of dust (as well as noise). For this reason, the machine had to be separated from the rest of the production line and housed in its own sealed room. Transferring finished saw blades offline for surface treatment acted as a brake on production output. 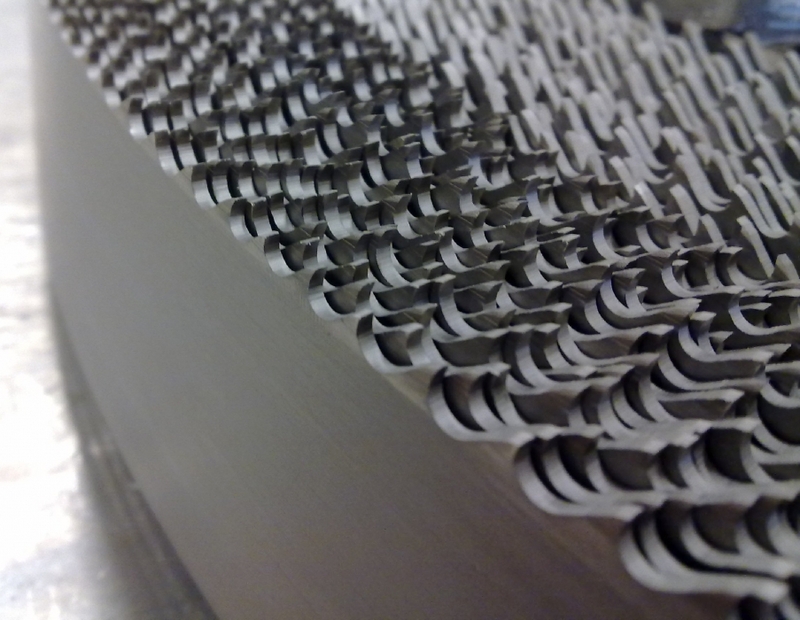 Surface treatment is important for saw blades because it helps to create a better cutting edge. At the same time, it makes the surface more reactive and gives a much better hold for the protective oil – which helps to prevent rusting. Both these attributes have been improved since the introduction of wet blasting. For example, the ability to carry out edge radiusing can help to prolong the life of the blade, says Jiří . In addition, wet blasting is an in-line process that is now an integral part of the production line. There is no need to transfer blades to a separate room – hence the boost in production speeds. The Profelis model also has an 'auto top up' system for abrasive media that kicks in based on the time run. There is also a system that uses cyclones to remove broken down abrasive, with a re-circulated rinse package to keep the whole system as closed loop preventing any water loss. Jiří says he would definitely recommend wet blasting to others – which is clearly evidenced by the fact that, after five years, his company has permanently discontinued the use of dry blasting.